Uranus North Node entered Gemini the year 1423 BC. The date I get with Solar Fire is 27 August 1423. At that time, the North Nodes of Pluto, Saturn and Jupiter were also Gemini; North Node of Neptune was in Cancer). It is quite surprising that at that time, Pluto was in Capricorn forming a square to Uranus in Aries, while Neptune was in Pisces. According to Solar Fire, these planets have been in these Signs only once since that time: that is in our current time. Amazingly enough, when the North Node of Uranus entered Gemini, forming a conjunction with the North Node of the Moon, and the North Node of Mars, asteroid Lucifer was also right there, at the early degrees of Gemini (3°55'). I haven’t found much information about the historical context of that time yet. It seems that was a time when ‘empires’ where rising or becoming stronger, such as Egypt and the Hitites. Crete was conquered by the Mycenae. Also, it is possible the Exodus of the Jewish people from Egypt occurred around this time (the shift of the Uranus Nodes from Taurus/Scorpio to Scorpio/Gemini, the Pluto/Uranus square and Neptune in Pisces could correlate to this event). It seems the earliest traces of the Olmecs date from this time. Uranus correlates with the original blueprint for each Soul, the Soul’s inherent design, and how this inherent design intends to liberate from any conditioning factors that are created through the Soul‘s evolution. It further contains all the memories and different types of memories of the Soul’s experiences along all of its lives. Both the original blueprint or ‘idea’ and the long term memories, by manifesting in the individual conscious awareness, serve for the Soul’s ongoing liberation and evolution of each individual and the species. This ongoing evolution of each Soul, and the species, requires in order to take place, an evolution of the brain and the nervous system. This occurs because the human consciousness within time/space reality operates through a material body and the senses that create an interphase between the consciousness and the material world. The evolution of the brain in turn reflects the evolution of the consciousness as it becomes capable of integrating and operating within an ever more complex and vaster perceived reality. The ongoing complexity of the brain along the evolution of the species, reflects the ongoing complexity of reality the human consciousness is able to deal with. Uranus correlates with the brain and the nervous system. Uranus is the higher octave of Mercury, and at same time, Mercury is the ruler of Uranus North Node. There has to be an evolutionary meaning why the North Node of Uranus is in Gemini, and the South Node of Uranus is in Sagittarius. One implication of this nodal positions relates to an ever increasing complexity of the form of human life on planet Earth, dictated by the growth of population, which has created the collective need for the majority of human Souls to live in cities. Living in cities creates for each individual an exponential increase in the interaction with other individuals, a tremendous multiplication of the communication and language forms and codes. Living in cities demands precise operational regulations, which in themselves are not ‘true’ but relative and arbitrary, ie. can be this or that way, bur need to be some way, determined within a range of possibilities which are dependent on nature. Other fundamental reason for the Uranus North Node being Gemini relates to types of knowledge the species has the intention to develop for its own evolution. This includes among others what we now call science. Science is created through the Mercury archetype. Sagittarius demands direct experiential knowledge. This is the condition of validity for Sagittarius knowledge of the universal or general. The conditions of validity of Mercury based knowledge are different. It would seem to me that the experience of evidence or truth of the Sagttarius archetype is individual in nature, as supported by the Grand Trine between Sagittarius, Aries and Leo. In turn, the natural Grand Trine between Gemini, Libra and Aquarius, reflects the natural law of sharing. Mercury itself is about communication. Mercury rules of validity for any type of knowledge are based on methodology. Methodology allows to consider valid knowledge of phenomena that are not directly perceived. It further allows to consider false any ‘knowledge’ which does not comply with methodology. Thus, Mercury knowledge can be developed with basis on the findings of others, and through dynamics of communication and sharing of information. This is different than Sagittarius knowledge, because Jupiter demands direct experience. Sagittarius is essentially experiential. However, it does not refer to the experienced phenomena themselves, but rather, to the basis or universal patterns that allow for phenomena to manifest they way they do. Thus, it correlates to universal or general laws or underlying principles. It seems to me this is what is called induction. In turn, Mercury relates to deduction, ie. application of whatever knowledge that is considered to be true, in order to make connections with phenomena and determine which truths follow or derive from the original knowledge, or law, through linear reasoning. One application of scientific knowledge is also what is called technology. It is interesting that when the Uranus North Node entered Gemini, Mercury, ruler of this North Node, was conjunct asteroid Scientia. Both were in Leo (at 11°22' Mercury and 8°28' Scientia), which suggests the intention for the species and individuals to create new types of knowledge serving for the adaptation on the planet. While considering the north node of Uranus as directly linked with future oriented intentions of the Uranian archetype, I think it is necessary to view both nodes of Uranus as future oriented, ie. not the south node as relating to the past versus the north node relating to the future. This is based on the non-linear nature of the Uranus archetype. Is this correct Rad? 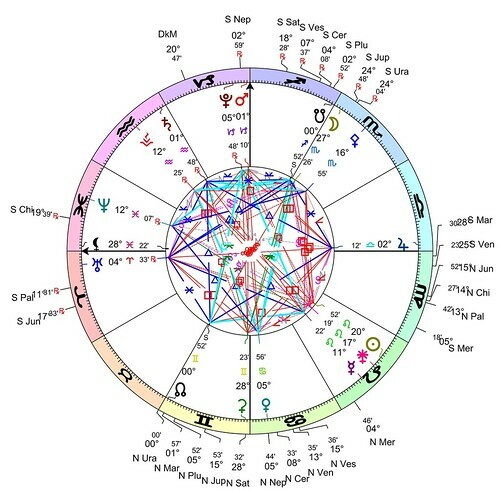 Given that the natal Mercury in all birthcharts is the ruler of the North Node of Uranus for all people on the planet since that time, I am intuiting that Mercury has to be viewed in connection with the intentions of liberation and actualization of the original blueprint for each Soul. I’m only intuiting and thinking about how this has to be done. Other application of these insights is that now I feel that my investigation on Mercury should become more oriented to scientific types of knowledge, versus trying to orientate to metaphysical or spiritual knowledge. Do you think this is correct, Rad? [this is based not only in the nature of Mercury, but also in my natal signature with Uranus in the 3rd House, the North Node of Uranus in the 11th House, ruled by Mercury in Virgo; and further, the Uranus 3rd House Sun: current life purpose]. (by the way, I already ordered the book on Emotional Anatomy, and expect to receive it next week). The facts the Pluto/Neptune/Uranus are currently in the same Signs that they were in when NN Uranus shifted into Gemini, and forming the same Pluto/Uranus square, seem very meaningful facts to me. While an underlying bottom-line collective intention for the species at the current time is aligning with natural law, the dynamics of sharing specific knowledge and information seems to be critical for the evolutionary transition, because many people will need to know what this transition is about through communication. Further, at an individual level, all Souls currently in the planet, or the majority of these Souls, have incarnated in this time frame because of their own intense needs to evolve, in specific ways involving the resolution of specific dynamics or situations. This means not only embracing truth in a general way, but to be able to identify very specific issues each individual needs to address. I feel there is much more to understand about this, but I am not able to see it at the moment. There is much more to this, because Uranus is also the ruler of the South Node of Neptune, which is Aquarius. Thus, ultimately, Mercury linear based knowledge, could be viewed as a vehicle for application of spiritual desires. Thanks so much for any further suggestions or indications in order to advance with these ideas, or rectification if any of the above is not correct. If anyone else has further contributions o observations on this, please feel free to participate. Thanks for sharing this. It sure gives one alot to think about. I think I will be reading it over and over again. Its a well thought out and fascinating piece of work! This is wonderful that you have started this thread. And all that you have shared about your own sense of what this means is really accurate from my point of view. Hopefully others will also share their own sense of what this means. "While considering the north node of Uranus as directly linked with future oriented intentions of the Uranian archetype, I think it is necessary to view both nodes of Uranus as future oriented, ie. not the south node as relating to the past versus the north node relating to the future. This is based on the non-linear nature of the Uranus archetype. Is this correct Rad?" No, not entirely. With the S.Node of Uranus in Sagittarius this does in fact correlate to the past in that it directly correlates to all the Natural Laws that were set in motion at the moment of Creation itself. Sagittarius is part of the natural Mutable Cross involving Pisces: Creation. So from the point of view of the past, a collective long term memory, this correlates to the inherent knowledge in all Souls that correlates with those Natural Laws. So, for example, I do not need a Bible or anything else to tell me that it is INHERENTLY WRONG not to put my baby on the autobahn. With the N.Node in Gemini for Uranus this of course correlates with all the natural ideas that emanate from those Natural Laws, and how to thus apply them to the current reality, and the future reality that will occur. So a simple example: how many of the Natural Laws of Nature are being ignored or transgressed by humans, whatever the rationalization are for that..Virgo, that have and will lead to various types of planetary and human traumas, Uranus, because of such transgressions and purposefully ignoring that Natural Laws ? A certain percentage, sub-groups, Uranus, understands this and thus try to do what they can do to educate, Sagittarius, other humans as to the consequence of this. Other sub-groups then create their rationalizations as to why they don't care about this, and others simply don't pay attention at all. So, yes, the past is always always conditioning the current moment just as the current moment is being conditioned by the evolutionary pressures of the future. This dynamic tension between the past and the future is of course manifest in each moment. "Other application of these insights is that now I feel that my investigation on Mercury should become more oriented to scientific types of knowledge, versus trying to orientate to metaphysical or spiritual knowledge. Do you think this is correct, Rad?" No. It is part of the whole that in fact includes every type of knowledge: the natural Mutable Cross of Gemini, Sagittarius, Pisces, and Virgo. The fall of Jericho and the conquest of Canaan occurred in 1422 BC. Moses is believed to have died in 1423 BC. BTW - I just remembered reading a book a year or two ago about this time period. I remember as I was reading it that there were certain aspects of Amenhoptep that reminded me of Obama. Not personality so much as ideology. I will try and remember what book it was and post the name/author in case anyone is interested. I realize that I am confusing my Amenhoteps. It's the 4th who reminded me of Obama. Thanks for the interest on this topic, and thanks Cat for the additional info on this time frame. I plan to post some analysis of the chart for the Uranus NN Gemini Ingress. Still looking for some further historic perspective on that time. Basically, I would like to link the social changes that were occurring at that time, translating in changes in the way of life, with how forms of language, thought, and communication needed to change to adapt to the social changes. And how this implied or promoted changes or an evolution at a cognitive/perceptual level. I already found a book that proposes this approach though not specific to this time, which is very focused in changes between nomadism and agricultural people: it is called The Perception of the Environment, by Tim Ingold. Very interesting. Also the works on the impact of cities by Lewis Mumford, and the Treatise on Nomadology by Gilles Deleuze. Hope I can digest some of these ideas and come back with more soon. The Eighteenth Dynasty of ancient Egypt – 1570 to 1293 BC – sometimes known as the Thutmosid Dynasty because of the four pharaohs named Thutmosis (English: Thoth bore him). – credited as the author of all works of science, religion, philosophy, and magic. The Greeks further declared him the inventor of astronomy, astrology, the science of numbers, mathematics, geometry, land surveying, medicine, botany, theology, civilized government, the alphabet, reading, writing, and oratory. They further claimed he was the true author of every work of every branch of knowledge, human and divine. They gave themselves [the scroll as lector]-priest, the writing board as loving son. Instruction are their tombs, the reed pen their child, the stone surface their wife..... Man decays, his corpse is dust. All his kin have perished; But a book makes him remembered through the mouth of its reciter. Better is a book than a well built house... "
The composition of the Rigveda is usually dated to roughly between 1700–1100 BC (the early Vedic period). The Rigveda contains mythological and poetical accounts of the origin of the world, hymns praising the gods, and ancient prayers for life, prosperity, etc. The hymns were preserved by oral tradition for up to a millennium from the time of their composition. According to the Rigveda, the Vedic Mantras were composed by various seers who had 'seen' them in deep concentration. However, to post-Vedic tradition, the Vedas are "not human compositions," being supposed to have been directly revealed, and thus are called śruti ("what is heard"). Thanks Linda for the references and links. I'm still in the process of analyzing the Uranus NN Gemini Ingress. I felt more context was needed, so I searched for a couple of prior astrological events. I would like to post some brief notes on the Pluto/Neptune/Uranus conjunction that occurred around 5036 BC. I added some quotes with further information on the time period on the footnotes, for anyone who may be interested. I would like to understand this chart more deeply, and then to analyze other chart which is the Pluto NN Gemini Ingress of 3 Sep 1870 BC, before dealing with the Uranus NN Gemini Ingress. If anyone has got the charts for prior Pluto/Neptune/Uranus conjunctions, it would be great if you could post them. If anyone would like to comment on this, participation is welcome. The Pluto/Neptune/Uranus conjunction of 5036 BC occurred in the Sign of Aquarius. If Solar Fire is working properly, the next triple conjunction of these planets occurred only in 578 BC or so. The Pluto/Neptune/Uranus conjunction lasted for some years. Below is a chart for one of the exact Pluto/Uranus conjunctions, with Pluto/Uranus at 11° Aquarius and Neptune at 16 Aquarius. They are part of a stellium in Aquarius together with the Sun, Juno and Mercury. The date of this chart is 15 March 5036 BC. The Pluto/Neptune/Uranus conjunction reflects a grand scale revolution in human consciousness and culture at the 5th Millenium BC (1). It seems development of agriculture had already started at least some five millennia before this time. It is possible, though, that agriculture was becoming dominant around the 5th millenium BC, and that new technologies were implemented extensively which created massive changes in the economy and overall way of life in the long term. Domestication of seed plants in the Neolithic revolution, irrigation, and organized labor (which had also existed in nomadic cultures much earlier), would, in the long run, translate in an increased food production, allowing for growth of population (2). This process, though, took several millennia to take hold. It seems nomads and pastoralists preferred their richer and more varied diet, which also required much less work to be obtained. Population did not grow for several millennia as a consequence of agriculture. New types of diseases developed because of the new type of food. A genetic adaptation within the species was demanded by the new diet in order for large groups of people to become primarily dependent on grains, and to develop new antigens in the blood stream (Pluto/Neptune conjunct in Aquarius, NN Neptune in Taurus-survival- ruled by Venus at 29° Pisces; Saturn in Aries square the nodes, Mars in Scorpio square Pluto/Neptune) (3). Regulation of labor dictated the need for organization and discipline. Increased complexity of networking set the basis for hierarchical power, and for the use of repression and violence. Agriculture set in notion desires for accumulation of land and production stock, which become equivalent of social status and power. Accumulation demanded new technologies and mathematics and written language needed to develop in connection with stock accounting and commerce; also form hydraulics and engineering. These changes in the economy will translate in changes in the family structure (Moon’s nodes in Capricorn/Cancer) because of the males agriculturalists desires to have wife and children to provide labor hand, and further, to be able to inherit land from the father and then pass it on to the male descendent. The widespread use of baked clay allowed for storage and accumulation, and later for writing tables (Saturn in Aries square the nodes) (4). Monogamous family existed before this time, but the pressures to conform to this structure ought to have become very intense during this transition to agriculturalism. The repressive nature of this type of family structure will be a cause on itself for emotional distortions that will lead to increasing violence and wars in the centuries and millennia to come. In turn, increased production, larger population within an ordered social structure made possible by means of accumulation of grains, linked with desires to secure and expand borders, will later translate in the formation of empires (Saturn/Moon in Aries square the Capricorn/Cancer Moon’s nodes, Mars Scorpio square Pluto/Uranus/Neptune). It seems that some debate has taken place about the Goddess connection with agriculture. It seems clear that nomadic cultures before the Neolithic and agricultural revolutions worshipped the Goddess and the sacredness of the Earth as life-giver. Some have proposed, based on the abundance of Goddess statues and figurines at early agricultural places such as Catal Huyuk, that women controlled most of the early economy, and culture and religion, based on agriculture. In the Pluto/Neptune/Uranus conjunct chart, however, we can see both evolutionary intentions for the species to recover original/matriarchal roots (Aquarius) and at the same time, the basis for a dramatic advance of patriarchy. This occurred during the Sagittarius sub-age of the Gemini Age, thus, the interplay between beliefs based on natural law and man-made beliefs. At same time, the interplay between nomadic forms of life, and living in villages and cities. With the Saturn in Aries square the nodes, we can see the impact on agriculturalists of pastoralists of the kurgan hypothesis type which would come from the East in later centuries. However, at the same time, the Pluto/Neptune/Uranus conjunct in Aquarius, with the NN of Neptune being in Taurus conjunct Ceres, and the Pluto conjunction being trine the NN of Ceres in Gemini, we can see that this was a time when the ancient religion of the Goddess would have revived though the fertility rites connected with agriculture: a religious and spiritual revolution. • 5000–4000 BC: Bowl, from Banpo, near Xi'an, Shaanxi, is made. Neolithic period. Yangshao culture. It is now kept at Banpo Museum. • c. 4350 BC: Kikai Caldera forms in a massive VEI7 eruption. • 4300 BC: Theta Boötis became the nearest visible star to the celestial north pole. It remained the closest until 3942 BC when it was replaced by Thuban. • Rice is domesticated in China. Later it is introduced in the Ganges Valley and the rest of Asia (c. 5000 BC). • Maize is cultivated in Mexico (c. 5000 BC). • c. 5000 BC, agriculture starts in Ancient Japan. Beans and gourds are cultivated. (Wikipedia article on 5th Millenium). (2) “Farmers colonized the eastern terminus of the Fertile Crescent, establishing villages in southern Mesopotamia. Although drier than the Levant, the alluvial lowlands near the Persian Gulf are especially suited to irrigation due to the configuration of natural watercourses and the overall topographic setting. Between 7,800 and 5,800 years ago, the local population constructed and managed a growing network of irrigation canals. As the area of irrigated cropland expanded, the population and villages grew in size. Large-scale irrigation was another important step in redesigning the environment that had substantial consequences for the human population. It entailed significant alterations to the physical landscape, not simply to its plant and animal inhabitants, and expanded human knowledge in a new realm: hydrology and water engineering. Moreover, the larger canals eventually acquired another highly important function-facilitating transport and trade among the growing network of communities in the Mesopotamian alluvium (Hoffeker, John. Landscape of the Mind. Human Evolution and Archaeology of Thought). (3) “Bioarcheologysts have linked the agricultural transition to a significant decline in nutrition and to increases in disease, mortality, overwork and violence in areas where skeletal remains make it possible to compare human welfare before and after the change” (Joan Coatsworth, quoted in Chistian, David. Maps of Time, an Introduction to Big History). (4) Wikipedia article on Pottery states: “The earliest history of pottery production in the Near East can be divided into four periods, namely: the Hassuna period (7000-6500 BCE), the Halaf period (6500-5500 BCE), the Ubaid period (5500-4000 BCE), and the Uruk period (4000-3100 BCE). The invention of the potter's wheel in Mesopotamia sometime between 6,000 and 4,000 BCE (Ubaid period) revolutionized pottery production. Specialized potters were then able to meet the expanding needs of the world's first cities. Pottery making began in the Fertile Crescent from the 7th millennium BCE. The earliest forms, which were found at the Hassuna site, were hand formed from slabs, undecorated, unglazed low-fired pots made from reddish-brown clays. Within the next millennium, wares were decorated with elaborate painted designs and natural forms, incising and burnished. By 4000 BCE, the potters wheel was developed. Newer kiln designs could fire wares to 1,050 °C (1,920 °F) to 1,200 °C (2,190 °F) which enabled new possibilities and new preparation of clays. Production was now carried out by small groups of potters for small cities, rather than individuals making wares for a family. The shapes and range of uses for ceramics and pottery expanded beyond simple vessels to store and carry to specialized cooking utensils, pot stands and rat traps. As the region developed new organizations and political forms, pottery became more elaborate and varied. Some wares were made using moulds, allowing for increased production for the needs of the growing populations. Glazing was commonly used and pottery was more decorated. I am sorry it has taken me so long to begin to read through this thread, but it is fascinating to me that in the 1423 BC chart you posted with Uranus north node shift to Gemini, there is a square between Pluto and Uranus, with Pluto being in Capricorn conjunct Mars, and Uranus being in Aries- basically at 5 or 6 degrees of these cardinal signs- basically exactly in orb to the current square between Pluto in Capricorn and Uranus in Aries. It makes me sense a timeless link between that shift of Uranus into north node of Gemini and today, like a portal. We can add to this the fact that Neptune was also in Pisces in 1423 BC and also conjunct the current placement of Neptune in Pisces. I was just looking at that chart for the first time so just noticed this, and will return later to you with more thoughts. But at the outset it makes so much sense to me that the north node of Uranus would be in Gemini, with everything that has transpired between then and now. 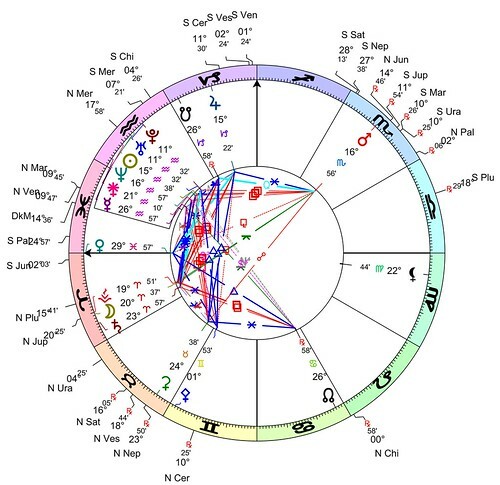 One immediate thought involves the fact that in this chart, Jupiter in Libra is forming a t-square with the Uranus Aries and Pluto Capicorn square, and Jupiter in Libra is also conjunct the descendant in the 7th house. This seems to me to be about the idea of "right"/"just" human relationship. Like you and Rad have begun discussing, this could relate to the south node of Uranus being in Sagitarius, and Natural Law- how do our humanmade laws align with Natural Law and effect our human relationships with one another and the rest of life on our planet. And to just make it all the more fascinating, that Uranus in Aries is conjunct the ascendant of this chart, and Pluto in Capricorn is conjunct the midheaven, and that Jupiter in Libra is conjunct the descendant. And then, that the north node of the Moon is in Gemini is at the beginning of the third house, the south node of the Moon is in Sagitarius is at the beginning of the ninth house, and that the Moon is in Scorpio at the end of the eighth house, conjunct its own south node. This chart appears to me to be highly significant to consider in terms of the evolution of consciousness on our planet. From my initial look into the time period of the shift into the North Node of Gemini, it would appear that metaphysical and spiritual knowledge is key with this shift. I can see your point about science, but perhaps this is somewhat along the connection with alchemy- a scientific approach integrating the spiritual and metaphysical. I am not sure I have found any perfect dating system yet, but it seems the story of Moses may have happened after the shift in 1423 BC. In any case the allegory of the story of the Bible, with the ten commandments, seems to very much fit this shift. Laws for just human relationship, connected with a divine source according to the human delivering or channeling the message. In addition, the link Linda mentioned with the Rig Veda seems incredibly connected with the symbolism of the shift to a north node of Gemini with Uranus. The Vedic age of India, the knowledge integrated into Sanskrit, this seems to me to be a perfect example of this shift. I also note on the timeline provided by Cat that development of civilization along the Mississippi River is connected with the 1423 BC time period. I don't have anything to add to this at the moment, but on a personal note I am hoping to find something as I was born at the "mouth" of the Mississippi. Finally, I started reading a book about Crete civilization that was totally fascinating to me and put it aside- it actually made a case for linking it with the idea of Atlantis even- the fact Crete fell in this time period, through volcanic eruption or invasion, also feels important- though I do not know exactly why at the moment- but it seems to me a huge shift of an advanced civilization of the time going through death, with impulses for new archetypes of civilization forming at the same time. Not unlike our current times perhaps.